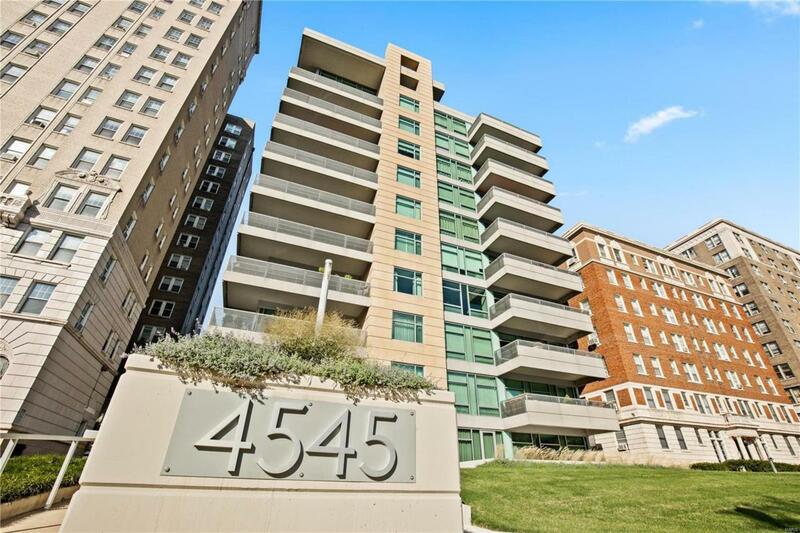 Fantastic 1 bed PLUS, 1.5 bath condo with treetop views in the desirable 4545 Lindell Condominiums. Ultimate privacy with an elevator opening to your door. A private entry opens to this light filled corner unit with floor to ceiling windows, 10 ceilings, bamboo floors and designer lighting. Over 1500 sq.ft of open concept space lives large. A gourmet kitchen fitted with granite counters, high end stainless steel appliances, tons of custom cabinetry. The separate den space is perfect for as a guest nook or office and is located next to the half bath. A massive master en suite includes a spacious bath with double vanities, separate tub and shower and huge walk in closet with laundry. Dont miss the luxurious terrace that truly extends the living space even further. All this plus assigned garage parking, extra storage, a workout room, available guest quarters and fantastic community lounge. Luxury modern living with the best of the Central West End at your doorstep.